Come face to face with Prehistoric Carnivores, infamous hunters that devour their prey. The majority of scientists consider the Mosasaurus, Tyrannosaurus rex, and Deinonychus to be predators; but whether or not they are scavengers instead of, or in addition to, predators is a matter of debate. Analyze these creatures and partake in the scientific discussion: predators and/or scavengers? 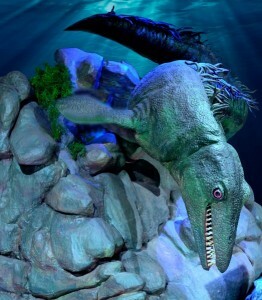 Keep an eye out for the oceanic Mosasaurus lurking in the shadows, waiting to ambush its next meal. Witness a pack of Deinonychus feasting on a Tenontosaurus carcass marred by lacerations, while a ferocious Tyrannosaurus rex protects its Triceratops prey in North America. Quickly walk past a dead herbivorous Protoceratops in Asia before its predator spots a new feeding opportunity. This delicious adventure satisfies all appetites! 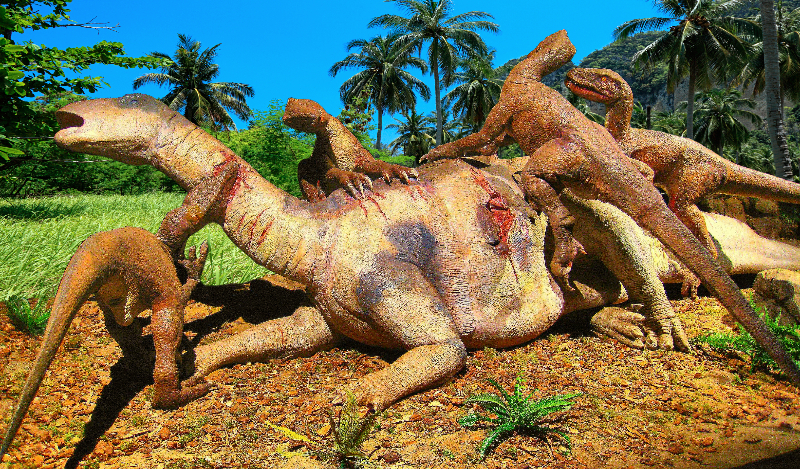 A pack of Deinonychus feast on a Tenontosaurus carcass with their powerful claws.